(1958, Black & White, Roger Corman, Samuel Z. Arkoff) "Prehistoric Lovers Against Primitive Beasts!" Rebellous young caveman Robert Vaughn ventures into an area forbidden by his tribe's laws in order to discover A SHOCKING TWIST ENDING!! With shorts Aquatic Wizards (a newsreel cavalcade of water skiing) and Catching Trouble (woodsman Ross Allen terrorizes Everglades wildlife). The second Roger Corman movie the guys faced. Most of it is standard 50s cheese, but the twist ending maybe have been slightly more effective when it was made, and everyone wasn't half expecting it from the beginning. Of the shorts, Catching Trouble is a classic. It's easy to build up a serious loathing for Ross Allen by the end of it, so Joel and the 'bots little pageant where they run a Ross action figure through a gauntlet of revenge is wonderfully cathartic. YouTube (2h) Premiered November 9, 1991. "A young man defies tribal laws and searches for answers. The result of his quest yields knowledge of past generations." Directed by Roger Corman. Written by R. Wright Campbell. Starring Robert Vaughn, Darah Marshall and Leslie Bradley. Our club showing of Mighty Jack will once again be at http://sync-video.com/tv/rodneylives, at 9 PM Eastern time, on Thursday (today). 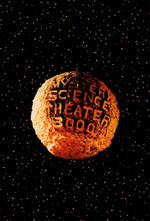 Information on our weekly showings of Mystery Science Theater 3000 can be found here. This, by my reckoning, is our 40th show! We're now about one-fifth through the 198 episode run of Mystery Science Theater 3000. Now, this week's title is, to me, rather odd... I can only remember movies of that era with "Teenage" starting with "I Was A"... ("I Was a Teenage Zombie", "I Was a Teenage Frankenstein" and the Michael Landon classic "I Was a Teenage Werewolf", which I looked up to make sure it does get MST3Ked... but not until Season 8) Still looking forward to "I Was a Teenage Man from UNCLE", or whatever. No, we're only watching Mighty Jack from now on. ALL MIGHTY JACK ALL THE TIME. Yeah, really I pasted most of that comment from last week's notice to save time, and that slipped through. I seem to remember hearing that this one is kind of a classic among B movies. Part of why I'm doing these MST3K club showings isn't just because I love Mystery Science, but because these episodes are a gateway of appreciating (some of) these movies unironically. Which is why I bother to include cast and crew information and IMDB links. Or, well, basically the same idea. TEENAGE CAVEMAN! It's only teenage caveman!